Bruce Willis, Morgan Freeman, John Malkovich and Helen Mirren all in one movie where they’re all total badasses?! Oh, I’m so there. 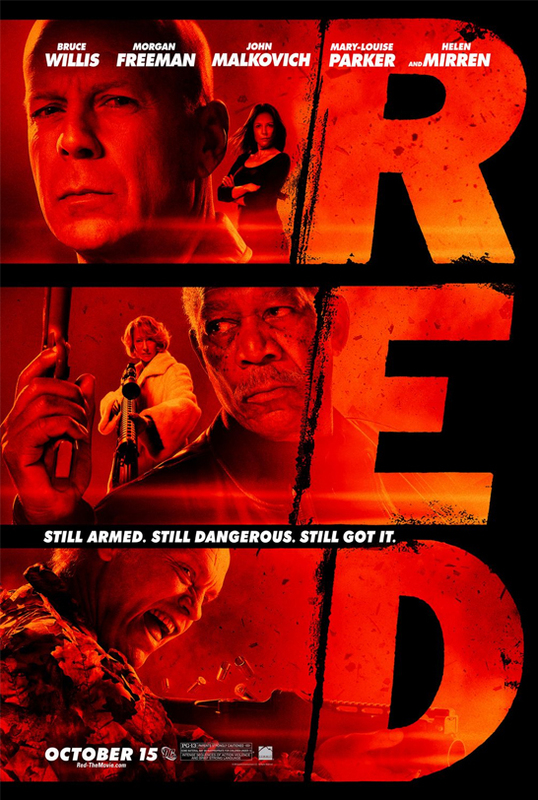 RED tells the story of a group of retired CIA agents who know too much about the company and are then chased. That’s all you need to know. Ok, yes the plot blows but Helen Mirren fires a machine gun. C’mon who doesn’t want to see that?! I bet you’re all wondering who is the best in this movie. John Malkovich wins this hands down. He plays his character with such paranoia and hilarity that he is easily the standout. But the “badass award” definitely goes to Bruce Willis. After taking out a helicopter with a cop car in “Live Free or Die Hard” you didn’t think he could do anything crazier. You are SO wrong. When driving a car, he gets shot at, pulls the E-Brake, gets out and immediately starts shooting. The car barely misses him. Yeahhh…that’s the best part of the movie. Now in all honesty, RED isn’t a very good movie. It could have been so much better with the cast they have. There really isn’t any plot and Morgan Freeman and Helen Mirren are probably in it for a combined total of 45 minutes. That one stings. I don’t think I would recommend paying 9 dollars to see it. Instead, wait for the Expendables to come out on DVD and watch that. Scary as hell. That’s all there is to it. …..Just kidding. No, this movie is actually pretty damn scary and gets pretty intense at times. And yes, it’s scarier than the first one. There are so many more elements to it. There’s a dog, multiple cameras, a bigger house and worst of all……a baby. BUM BUM BUM! However, if you are looking for something different than the first one, you’re looking in the wrong place. If you are looking for something intense and scary, you’re looking in the right place. You won’t look at stairs the same way. And if Teen Mom didn’t make you not want to have a baby, then this movie will do the trick. This is definitely the hardest and shortest movie review I’ve written. Mostly because I can’t say much without spoiling anything. The only downside to Paranormal Activity 2 is that nothing happens until maybe 45 minutes into it. But don’t fret, when it starts happening, it’s scary and worth the wait. All you need to know is that this is a prequel instead of a sequel. The couple in the first movie is related to the family in this one; it is the girl from the first one’s sister. And this happens before the first one happened. Long story short, freaky things start happening in the house and the dad believes its robbers but the daughter and mom thinks it’s a ghost so the dad puts cameras up. Watch and enjoy screaming. I get profane when I’m scared and let’s just say I’m glad I didn’t see it with my mom. Go see this movie before SAW 3D comes out.